When devices, aggregate units or machines are mass-produced, they undergo functionality testing for quality assurance purposes. In order to test a large number of samples quickly and comparably, you must be able to quickly connect and disconnect the connections for the units’ power supplies, as well as their signal and data interfaces, during the testing process. Until recently, hardwired solutions or standard industry connectors were available for such applications; such connectors were usually designed for only several hundred mating cycles. In practice, however, testing equipment may have to undergo thousands of mating cycles annually. Standard industrial connectors may be excessively stressed for such applications. When sample pieces and equipment are being reconnected, multiple times daily, other solutions are needed: tools, machinery and facilities with frequently changed connections require interfaces that can safely transmit power, data and signals, despite several thousand mating cycles. Thus, the connectors used must be suitable for high mating cycles. This is why HARTING has designed the Han® HMC series. The connectors in this series reliably meet the requirements of EN 61984, even after 10,000 mating cycles. This durability has been achieved by further developing the advanced design of the Han® industrial connector, e.g., the contacts are now covered with a special gold plating. The robust HMC hoods and housings are well-suited for harsh industrial conditions. Compared to the standard hoods and housings, the inter-connect system for these housings (size 6 B to 24 B) is optimised to reliably withstand 10,000 mating cycles. Only Han® D and Han E® contacts should be used with this series. The matching insulation bodies (used, for example, when contacts are integrated for the protective earth) have also been specially qualified for applications with high mating cycles. The HMC hoods and housings provide reliable IP65 protection for the connection. Special frames are used for the automatic docking stations, which enable high mating cycles. This series offers new possibilities for automated testing platforms. Since its launch in 2013, the Han® HMC has developed into a comprehensive product line that provides special hoods and housing, contacts and insulation bodies. These offer many opportunities for testing platforms or other applications that involve high mating cycles. 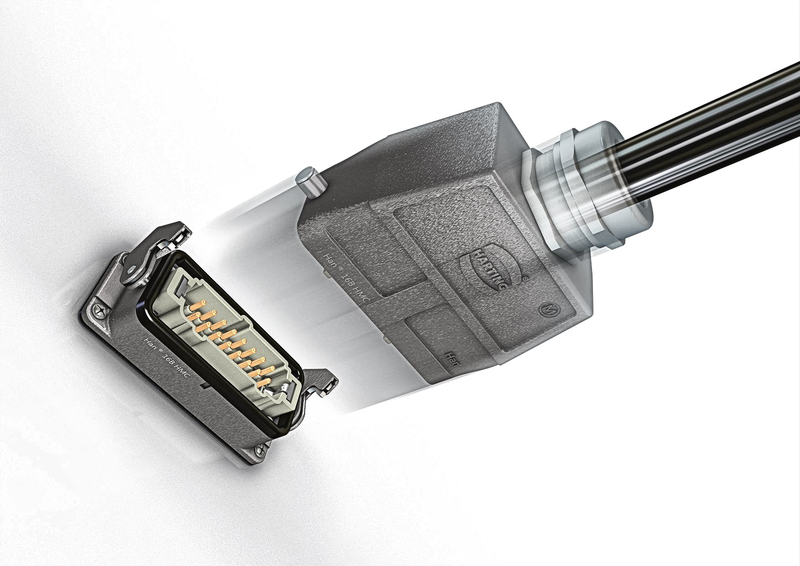 The quality of the connector components has been tested and certified by HARTING’s own HQT laboratory, which is recognised and certified by the German Accreditation Body. The HMC series is compatible with our standard connectors of the same size. This enables customers to gradually replace the connectors they have already been using with Han® HMC solutions, without need to make constructive design changes. Many testing platforms require a pneumatic interface – for example, to supply pneumatic valves islands or pneumatic devices with compressed air. 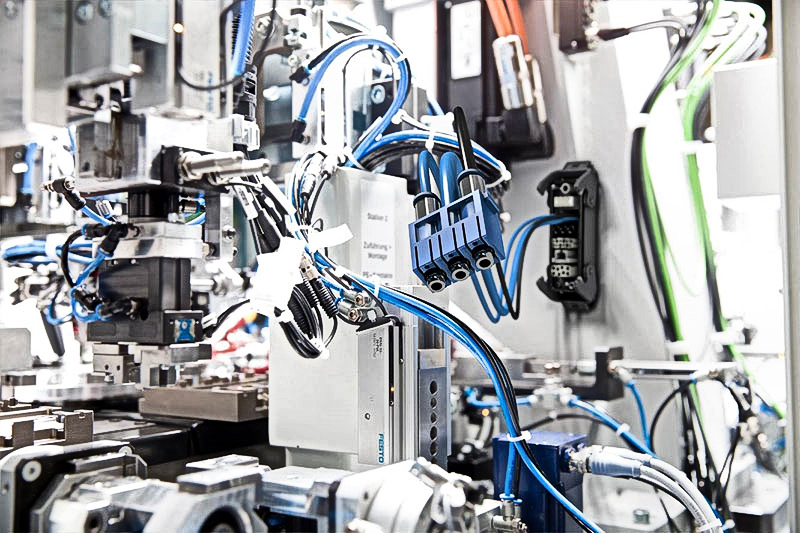 For such applications, HARTING has developed a variant of their proven Han® Pneumatic module. Unlike the previous variant with plastic contacts, the Han® Metal Pneumatic module can be used up to 10,000 mating cycles. These modules are also designed to withstand a continual operating pressure of 10 bar. Thus, they can be used for applications, which require an operating pressure higher than the normal industrial pressure of 8 bar. The Metal Pneumatic module can be used with HMC inserts for Han® D or Han E® contacts and Han® HMC modules. These can be placed in the Han-Modular® hinged frame or in special frames for automatic docking systems. The durability of the materials used in the HMC connectors and contacts, combined with their versatile modular design, enable you to transmit various media types through a single interface.